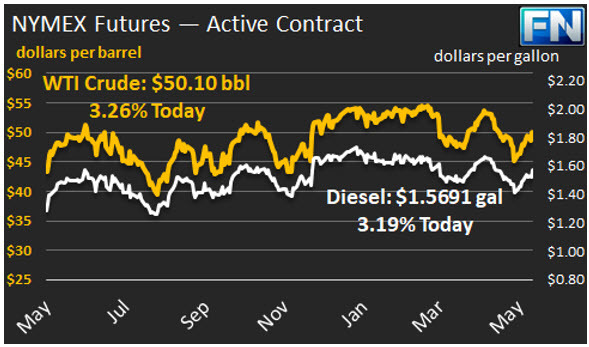 WTI crude prices have risen above $50/b this morning. WTI opened at $49.28/b today, an increase of $0.35, or 0.72%, above yesterday’s opening price. 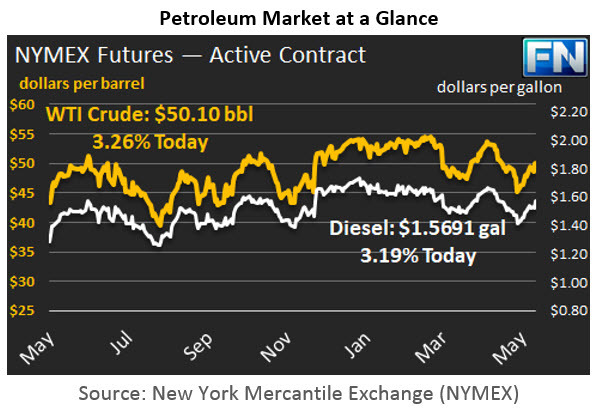 Current prices are $50.10/b, a significant increase of $0.75 above yesterday’s closing price. Prices have strengthened over the past two days based upon a favorable set of supply and inventory data, though the price history this week has been bumpy. Diesel opened at $1.5433/gallon this morning. This was an increase of 0.99 cents (0.65%) above yesterday’s opening price. Current prices are $1.5691/gallon, a jump of 2.38 cents above yesterday’s closing price. Gasoline opened at $1.6073/gallon today, up 0.91 cents, or 0.57%, from yesterday’s opening. Prices are $1.6263/gallon currently, an increase of 2.0 cents above yesterday’s close. Prices have been volatile this week. Supply-demand fundamentals improved by the second half of the week, but the price response was muted. It appeared that political turbulence surrounding the Trump Administration caused risk-off sentiment in the markets. The Dow Jones Industrial Average fell approximately 344 points between Monday’s market opening and Thursday’s market opening. The Justice Department appointed ex-FBI Director Robert Mueller as special counsel to oversee the investigation into the Russia issues, and this choice appeared to calm markets. Asian and European stock markets listed small gains overnight. This week’s data from the Energy Information Administration (EIA) was constructive. The data showed across-the-board inventory drawdowns for the second week in a row. This has happened only twice this year. U.S. crude inventories have now decreased for six weeks running. The drawdown in crude inventories is consistent with rising refinery runs. Refineries are finishing spring maintenance and are ramping up for the summer driving season. Refinery crude inputs have risen from 15492 kbpd during the first week of March to 17122 kbpd during the week ended May 12th, an increase of 1630 kbpd. Moreover, U.S. crude production dipped by 9 kbpd during the week ended May 12th. This broke a streak of twelve weeks with production increases. The market is increasingly confident that the OPEC-NOPEC production cuts will be extended, most likely for nine months instead of the originally proposed six. The formal meeting is scheduled for May 25th, but OPEC members are already in meetings to discuss market scenarios. The group is considering not only an extension, but the possibility of a deeper cut. Russia has shown greater commitment to the cuts also.